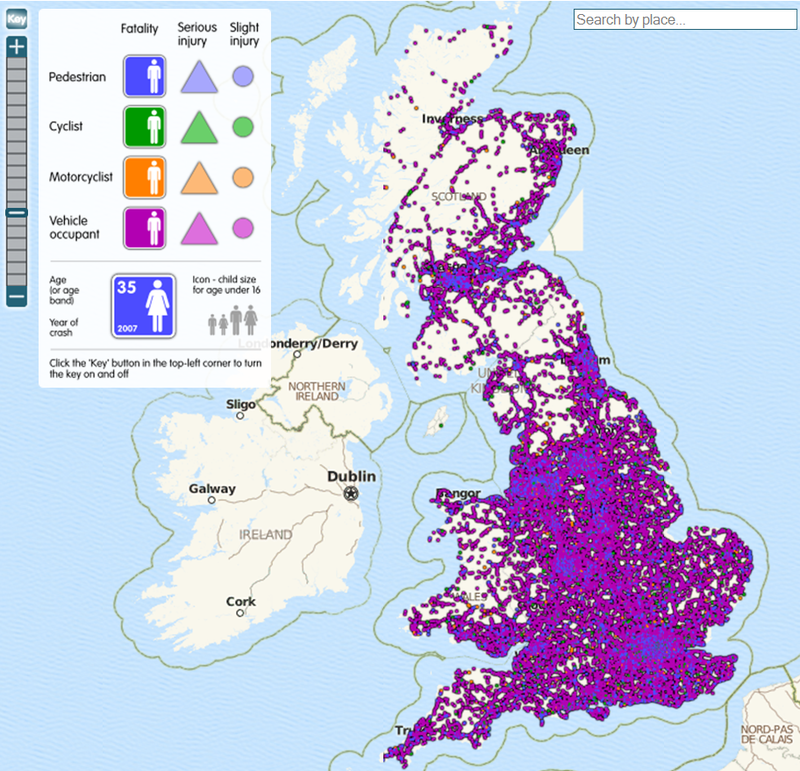 It's never been easy to create a taxonomy for maps but historically we used to be able to define a map by general function (general purpose, reference, thematic...), scale (small, medium, large...) or type (choropleth, dot density..) though clearly any single map can fall into multiple categories. This diagram (from a cartographic text book...yes, they do exist and are quite useful) used to provide quite a neat illustration of how we might categorize types of maps but does it still work for the multitude of new forms of map, new map-makers and new mapping techniques? Online has brought about a new wave of technological revolution in cartography (just as the printing press and computing more generally have done in the past) but are maps online that different? Aren't they just maps? I'm convinced some of the newer terms are unnecessary when perfectly good terms already exist but progress in anything is often accompanied by a shift in terminology that is designed to encourage uptake and adoption. But is that terminology actually offering anything new? Is the product so different it demands a new label? I've had a long standing side-project to collect the labels we confer on maps with the idea that I can create some sort of simple modern taxonomy, consign pointless terms to oblivion and focus on what's really important. Below is a list of words/terms/labels that we often see used to describe a map or which are used in conjunction with the word 'map' that I've so far collected. It's a mix of traditional, common use and vendor-specific terminology. Can you help? Please feel free to add comments below (or send me a tweet @kennethfield) to add to the list or offer your definitions. 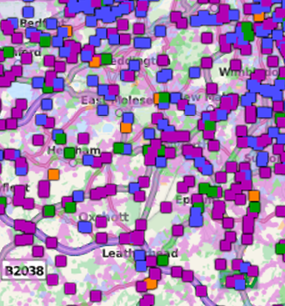 Alternatively, if you know of other attempts to categorize maps then please let me know. Thanks in advance! The Guardian recently published an interactive web map (built by ITO World) of the deaths and injuries from road traffic accidents 2000-2010 in Great Britain. That's nearly 33,000 killed and 3 million injured people...represented as separate points on the map. Viewing the overall picture at zoom level 4 (a scale of about 1:36m) we see the all too familiar mass of points on a web map with a legend that doesn't relate to the map we're seeing. Points overlap and coalesce. It shows very little other than the fact that there's an awful lot of death and injury. At this scale the data need aggregating in some sensible way. For instance, cluster analysis would spatially summarize the data and could be mapped using an isopleth technique for a more suitable small scale map. At any of the lower zoom levels (smaller-scale) the map is less useful still. At zoom level 9 (about 1:1m) we start to see a little more clearly that the dots have different colours but they are all still the same shape. If we look a little more carefully in the background we can just make out some lighter symbols. What are these? Are they part of the basemap or part of the data? It's worth mentioning here that the underlying basemap labels are obscured by the dots. If they cannot be placed on top of the data then why have them at all? At zoom level 11 (about 1:280,000) we see some symbols appear that resemble those in the legend but they are illegible. There are a lot of background symbols though...and with all that overlapping transparency the colours on the basemap are heavily compromised. Here then, we start to see that a neutral basemap in a single hue (e.g. light grey) containing very little detail would provide a more uniform background and allow the data to be seen more clearly rather than melt into the background. It's not until zoom level 15 (about 1:18,000) we start to see the symbols as they appear in the legend but is it any clearer? There are 12 variations of the symbols and they all overlap. Actually that's not strictly true as yellow circles and triangles seem to be the lowest layer and blue circles and triangles and pink triangles the highest so the latter take visual priority even though they represent categorical data. I've never been able to zoom in further than level 15 since it fails to draw any symbols beyond that scale but what can we take from this map in terms of its cartography? The importance of designing for specific scales cannot be underestimated. Putting a mass of points on a map simply doesn't work at most if not all scales. 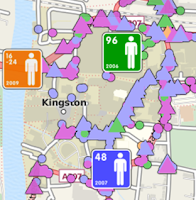 At smaller scales, data needs manipulating so it is in a form suited to a small scale thematic map type. At larger scales, symbols need to be simple and clear. 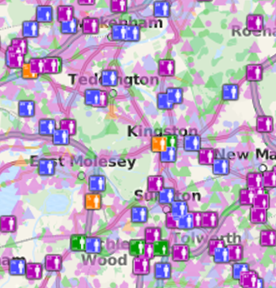 That said, I like the map for one simple reason...it's one of the first I have seen that has attempted to show a very complex data set by type rather than the use of a single coloured generic marker symbol. At larger scales the symbol design is generally good and gives a mechanism to visually disentangle incidents by type, transport, age, date and gender. It's doing what cartography was designed to do..allow the map maker to take complex data and classify, symbolize and provide a picture so patterns can be seen that goes beyond what a table, graph or uniform point marker web map can provide. It's not perfect as I've pointed out but it's pleasing to see web maps begin to show signs of cartographic thinking and design. 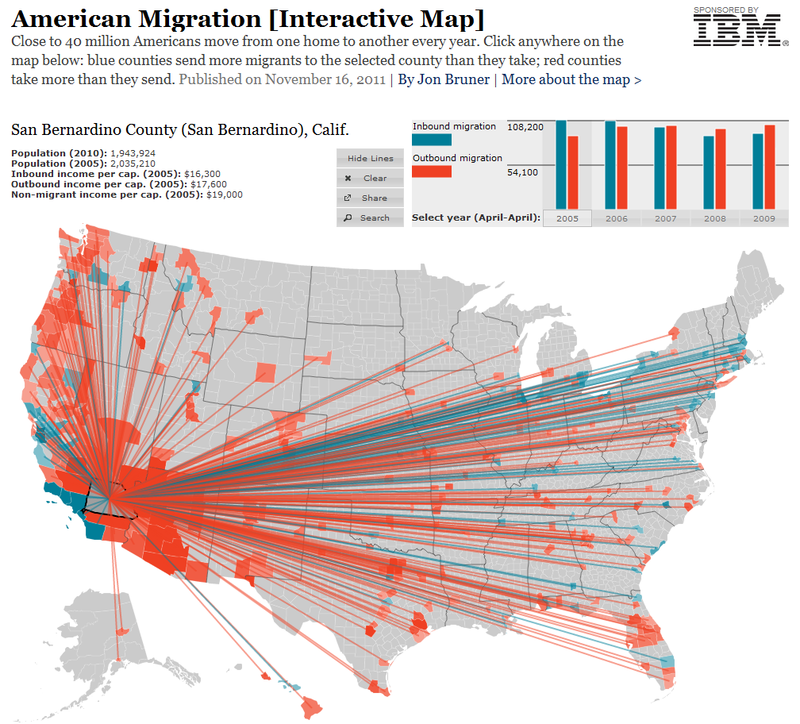 This map by Forbes (and IBM) on patterns of American Migration caught my eye this week (Go to the web site here). At first glance it's an elegant design and has the right sort of graphics and interactivity you'd want in a clean, authoritative web map. In cartographic terms though, it flatters to deceive. Here are a few thoughts on why the message of the map is compromised. The lines between areas add to the initial impact of the map but since they don’t actually represent quantity of migratory flow (through variable width/transparency etc) they provide very little and tend to obscure the choropleth underneath - particularly when there are a lot of lines. It’s good that they can be hidden but the idea of migration would be best served by making proportional line widths. So if they don't actually serve a purpose they're just chart-junk. I have a suspicion they are mapping totals rather than adjusting by area or population (we don;t learn what the choropleth units are anywhere). The pop-ups seems to support this notion so the map itself doesn’t illustrate sensible distributions. It’s cognitively confusing. A better choropleth would be to show the difference between in- and out-migration, per capita which would show the relationship between the two variables as well as being proportional to the overall population count. The inclusion of income per capita is a little confusing. What’s the message in relation to migration?...that people move to richer areas perhaps? It seems to have just been included as an additional variable. It would help if this was more clearly explained so the map reader isn’t left trying to decipher numbers and their relationship spatially, statistically or conceptually. So all in all it looks nice but actually offers very little and challenges the map reader to make any sensible interpretation. I've been after one of these for years and finally got the opportunity...I am now the very proud owner of an original 1933 London Transport Underground Railways of London map by H. C. Beck. It's the Third card folder edition, published in September 1933. It has a few modifications from the First Edition published in January 1933. Principally, the interchange symbols are now open circles instead of diamonds. There is also some smoothing of the original kink in the District Line near Ealing Broadway and 'London Transport' has been added to the bullseye (later termed Roundel). A new escalator connection had by now been added between Bank and monument stations and a large red notice added to the map this effect. The front cover no longer says 'A new design for an old map'. I recently came across a map (in the loosest sense of the word) a former student of mine once submitted in his/her final year undergraduate BSc Geography dissertation. It was so bad I took a picture for posterity. I can't recall the culprit's name but they studied at Nene College (now University of Northampton) sometime around 1996. There is no need for a commentary, just enjoy...and feel free to comment!